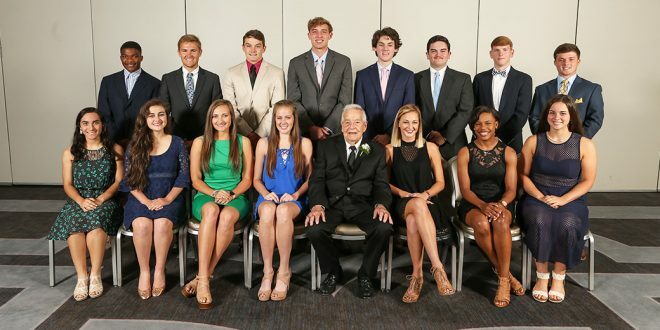 JACKSON – Sixteen outstanding seniors from across the state were recognized April 10th during the 22nd annual Lindy Callahan Scholar-Athlete awards banquet at the Jackson Hilton. The students were chosen by an eight-person selection committee for their combination of academic excellence, participation in athletics and contributions to their schools and communities. Each student receive a $1,500 college scholarship through the support of the MHSAA’s partners. The Scholar-Athlete awards were started by retired MHSAA executive director Ennis Proctor in 1996 to honor longtime Gulfport athletic director Lindy Callahan. Mr. Callahan, 89, attended Monday’s banquet along with Ann, his wife of 64 years, and their granddaughter Kimberly Best.